Cambria, CA. Central Coast. Friand and I embarked on the second leg of our anniversary adventure, making our way up the coast; final destination: Monterey Bay. The scene of our honeymoon, revisited every year on our anniversary. It’s turned in to a fun and wonderful tradition! This year, we decided not to make the whole journey in one trip, but to stop along the way. 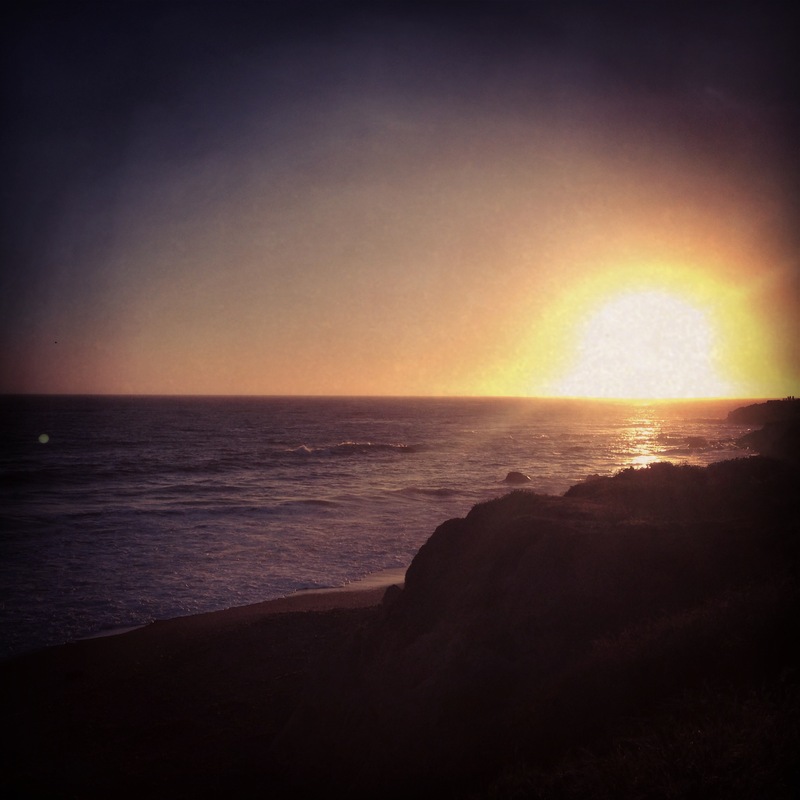 Friand suggested a night in Cambria, on the seaside scenic route of Moonstone Beach. What a great idea! Check out that view from The Blue Dolphin Inn where we stayed! Researching the local possibilities, Friand received some sage advice that we go to The Black Cat Bistro for dinner. Chef/Owner Deboarh Scarborough’s passion for food came through in every dish, every detail, of our evening. Seated in probably the only empty table left in the 45 seat house, I had the dubious honor of being the lucky person with the sun in their eyes. Our server was light hearted and reassuring that my eyesight would return in 10-15 minutes. I appreciated her instant acknowledgement of my predicament and her attempt to put me at ease. Not a problem! Sun was gone in about 10 minutes and with the sun just below the rooftop of the bakery next door, I was able to get some fantastic food photos! So what vegan food is there at The Black Cat? There are two vegetarian appetizers, two entrees and multiple desserts depending on what’s available that evening. I have to admit, they all sound terrific, so tell your vegetarian friends. They will be more than satisfied. We began with wine and bread. Sounds exciting, right? It really was. We enjoyed a delicate Central Coast Pinot Noir by the glass. Many wine connoisseurs know that many “by the glass” wines have lost their charm by the time they reach your table because they have been open longer than 24 hours. We were lucky tonight to have a nice fresh bottle! Perhaps this is the norm considering their by-the-glass menu is not so large as to lend itself to long opened bottles. The bread was served individually, not by the basket. At first, I was a little disappointed (I mean, I can put away a whole basket by myself) but then I realized that pacing myself before the meal even begins is really the smartest course of action. Probably a very good thing that this decision was made for me! The bread initially looked like the usual hard crust rolls, but the moment we touched them, they were still warm and actually quite soft. 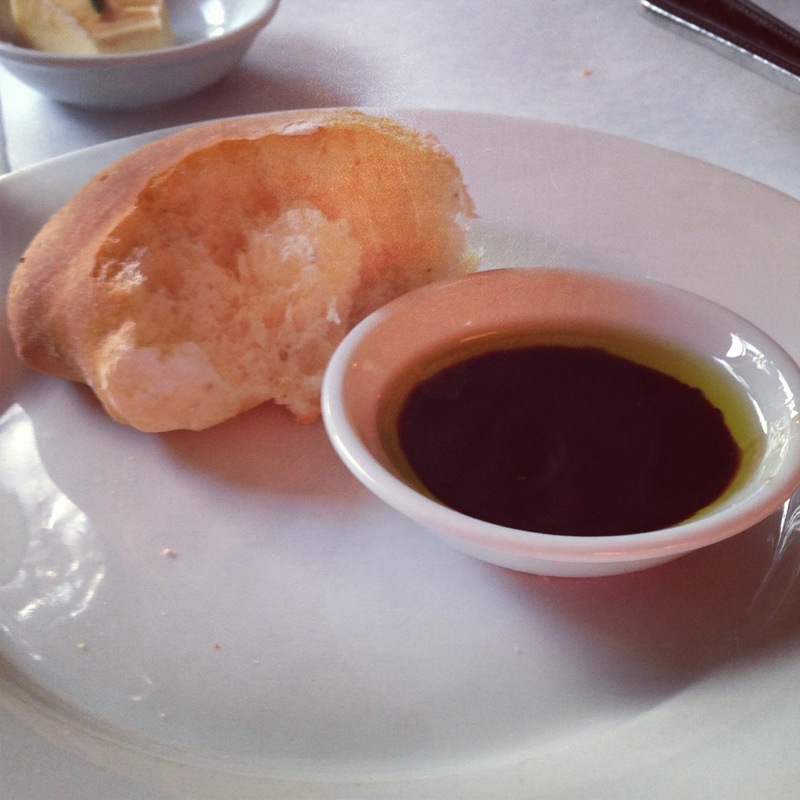 It was served with olive oil and balsamic vinegar in the same way that my Italian family always did it: in the same dish! In fact, I would say that “quality” balsamic was the theme of our meals tonight. I actually ended up not getting an appetizer. On the current menu, there is a bruschetta with chevre. I asked if it could be modified to be vegan. Our server did take a minute to ask the chef, but upon returning told me that without the cheese, the dish ends up being bread with kale and the chef did not recommend that. I do understand that with a small kitchen, a small kitchen staff, and 45 tables in a bustling seaside bistro, there really isn’t that much time to create a new appetizer on the spot. That’s ok. Really. Just keep the bread coming because if I can’t fill up before the meal on an appetizer, I’m sure not going to substitute with a salad. Bread bread bread please. The website does ask that if you require a vegan option that you call 48 hours in advance. We did just that and were assured that I would be served an interesting vegan meal off menu. Great! The server told me that the chef was preparing a “cauliflower dish” that was sure to please. And when that cauliflower dish arrived… well, let’s just say it was a conversation piece in the dining room! The moment the server walked away, the young couple at the table next to us just had to ask what this beautiful dish was. 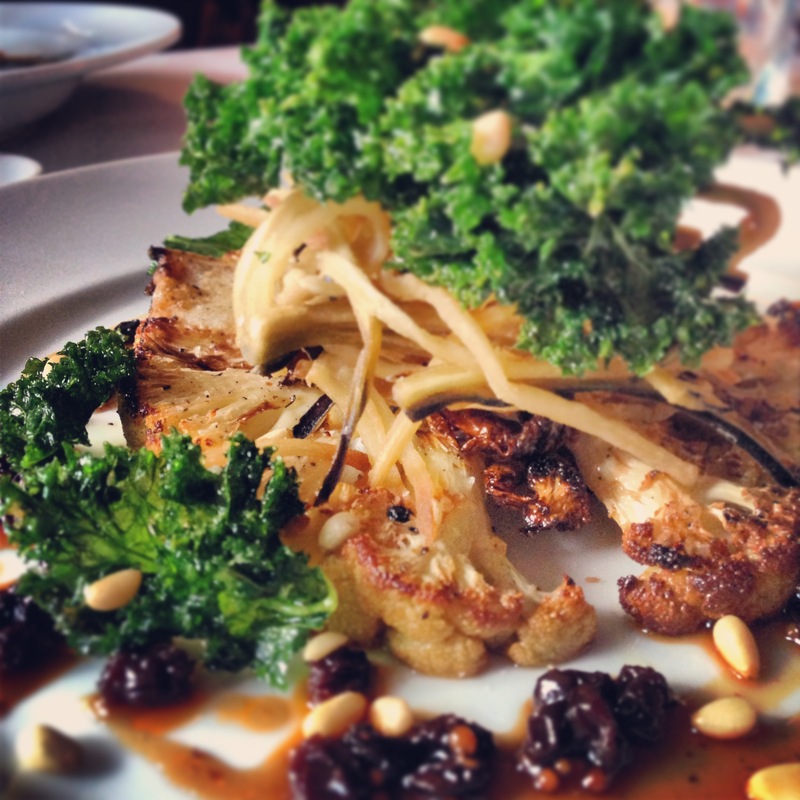 The server returned and described the dish in more detail: roasted cauliflower “filets” with zucchini strings and crispy kale, housemade pickled currants in a balsamic reduction with dijon and pine nuts. Oh baby! It actually tasted as great as it sounds. I really appreciated the fact that the chef did not fall back on the “usual” vegan substitute options of portabello mushrooms or eggplant or tofu. But really went out on a limb and chose a lesser appreciated vegetable: cauliflower! I heart cauliflower, and I don’t eat it nearly enough. It gave the potentially sweet sauce an earthy base. It was cooked perfectly al dente, and even the core (left in!) was soft and sweet. Great job, Chef! This one goes down in the history of The Valley Vegan as one of the most creative and interesting off-menu meals I’ve ever been served. After finishing our meals, the couple next to us struck up a conversation. Wine was flowing freely at both tables, and it was so much fun to meet people at a small place like this. I think that’s the point of such an intimate setting: to bring people together. And I loved it! I have to wish them a very Happy Anniversary (just in case they wander over here to this site!!) and safe travels and to say thanks for making our evening that much more enjoyable! Dessert? Oh yes please. The beauty of eating vegan food is that there is always room for dessert. 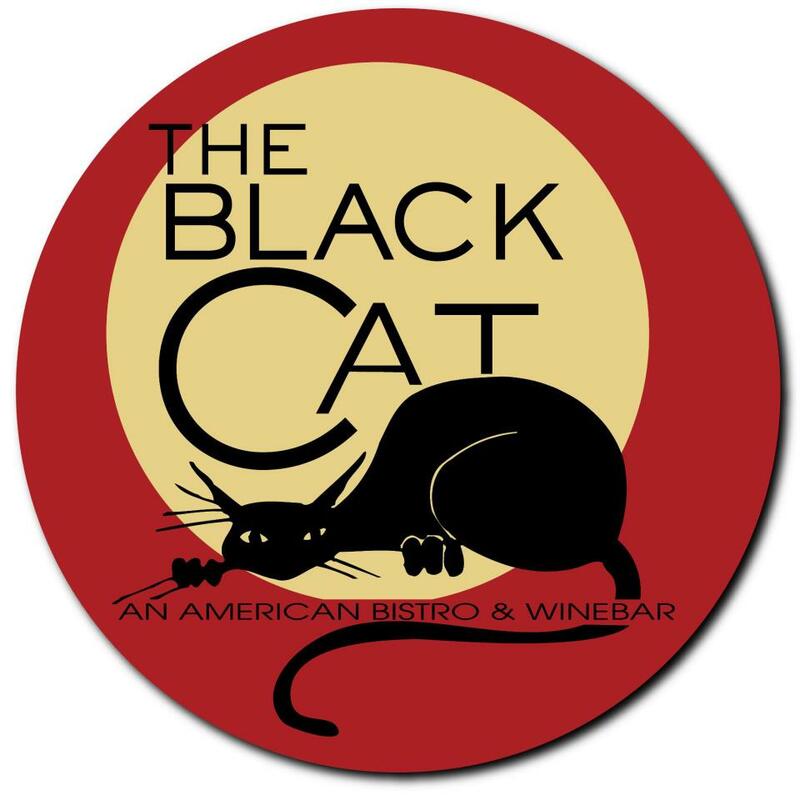 So what will a vegan be served here at The Black Cat? If you look at the menu it’s filled with rich decadent desserts – the envy of any great bistro dessert case. 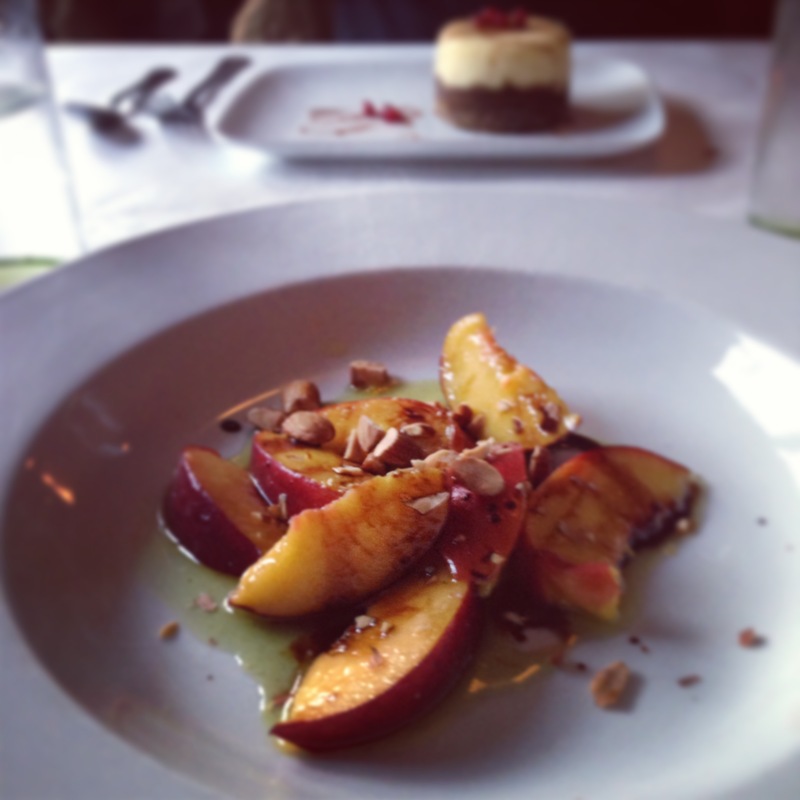 I was told that if I had room, chef was making me grilled peaches with a balsamic reduction and roasted almonds. Oh.my.seitan. That was fantastic! I’m not a big peaches fan (meaning, I just don’t like the fuzzy skin) but the cooking removed any weird textures (maybe there are others out there that feel the same?) and as any grilled fruit it became fantastically sweet and soft. I would recommend that you do ask about any and all balsamic reductions because often they are made with honey, and if you do not eat honey, you need to remind your server. The Black Cat Bistro is a shining gem in the heart of Cambria. Whether it’s your destination or just a stop on the journey, do take some time to pop into The Black Cat. They have cucumbers in their water! What else do I have to say? Obviously, this is a 5 sprouter, a place not only willing to make something off menu to accommodate the vegan, but to make something unique and memorable. Thanks for an incredible meal! Friand was also pleased with all aspects of his meal. Read his review on Yelp!. 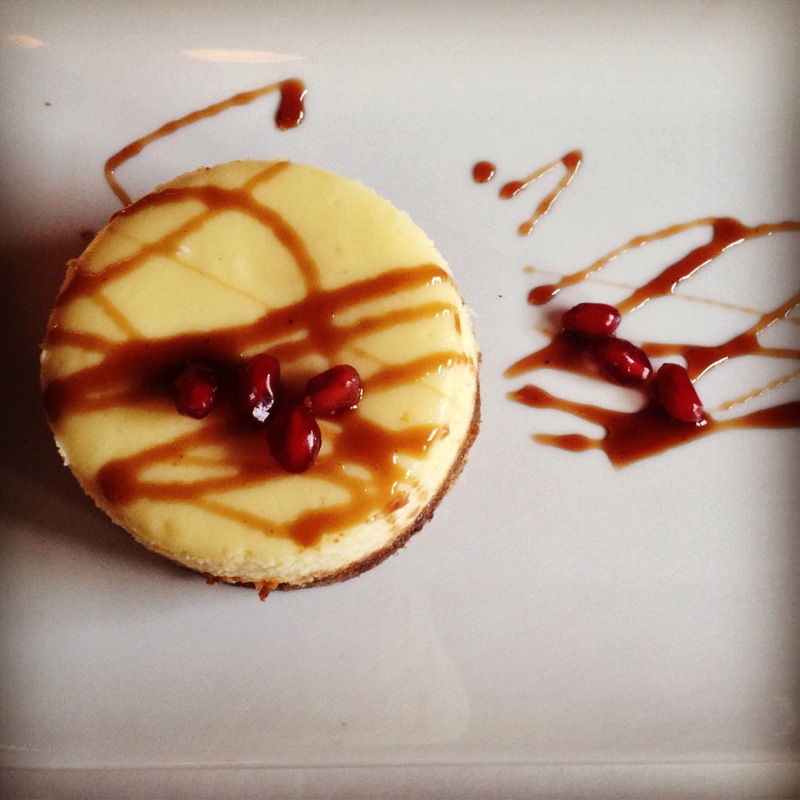 I have to share the photo he took of the Lemon & Chevre Cheesecake (gingersnap crust, pomegranate molassass and pomegranate). Beautiful, no?